Clinical practice guidelines have been developed aiming to improve the quality of care. The implementation of the computerized clinical guidelines (CCG) has been supported by the development of computerized clinical decision support systems. This systematic review assesses the impact of CCG on the process of care compared with non-computerized clinical guidelines. Specific features of CCG were studied through an extensive search of scientific literature, querying electronic databases: Pubmed/Medline, Embase and Cochrane Controlled Trials Register. A multivariable logistic regression was carried out to evaluate the association of CCG's features with positive effect on the process of care. Forty-five articles were selected. The logistic model showed that Automatic provision of recommendation in electronic version as part of clinician workflow (Odds Ratio [OR]= 17.5; 95% confidence interval [CI]: 1.6-193.7) and Publication Year (OR = 6.7; 95%CI: 1.3-34.3) were statistically significant predictors. From the research that has been carried out, we can conclude that after implementation of CCG significant improvements in process of care are shown. Our findings also suggest clinicians, managers and other health care decision makers which features of CCG might improve the structure of computerized system. Clinical practice guidelines have been developed to improve the quality of care, patient access, treatment outcomes, appropriateness of care and achieve cost containment by improving the cost benefit ratio [1–4]. At the same time many healthcare organizations have widely promoted the development of computerized clinical decision support systems (CDSS) with the aim of improving practitioners' performance [5–7]. According to the indications of regulatory systems, professional bodies and consumer organizations, CDSS can also support the implementation of the computerized clinical guidelines (CCG) . An effective model of CCG consists of computer accessibility, patient-specific reminders in the clinician's workflow and its integration with medical records, as demonstrated by Wang et al. . Even though different studies in literature are focused on demonstrating that CDSS can have an impact on physicians' behaviour regarding to patients' care [6, 10–12], there are very little evidence about the effectiveness of electronic guidelines [13–15] and impact of computerized support on implementing of clinical recommendations. In a qualitative systematic review, Shiffman et al. highlighted higher effect of CCG versus non-electronic systems. Due to the lack of studies containing quantitative evaluation, research was focused on a systematic review of available literature about the impact of CCG upon the process of care compared with non-computerized clinical guidelines (NCCG) (such as paper guidelines, peer-to-peer consultation and previous experience.). Moreover, were analysed specific features of the computerized guidelines which are potentially linked with the improvement of the process of care. Population variables: medical doctors, health personnel. The search in grey literature was carried out using general purpose search engines (GOOGLE, VIVISIMO) in order to identify missing articles. Rest of the articles were identified through the analysis of bibliographic citations. Considering study's design, only experimental or analytical studies were included while descriptive studies were excluded. The main exposure variable in our research was the comparison between CCG and NCCG (such as paper guidelines, peer-to-peer consultation and previous experience). Papers which did not contain comparison between CCG and NCCG were excluded from analysis. So, only the papers in which the guidelines were coming from a scientific society recommendations or approved by a National body, a scientific society, union or corporation of physicians or universities were included in this study. Articles not matching these criteria were excluded. Also, only articles focusing on adult patients (age ≥18 years) were taken into consideration. Studies involving children and adolescents (age <18 years) were excluded due to the fact that there are specific factors linked with the paediatricians adherence to guidelines in this specific age group [16–18]. Titles and abstracts of the selected studies were reviewed independently by two authors (C.S.C and A.R.) and were rated as "potentially relevant" or "not relevant" using search strategies based on study design, subjects and type of intervention. 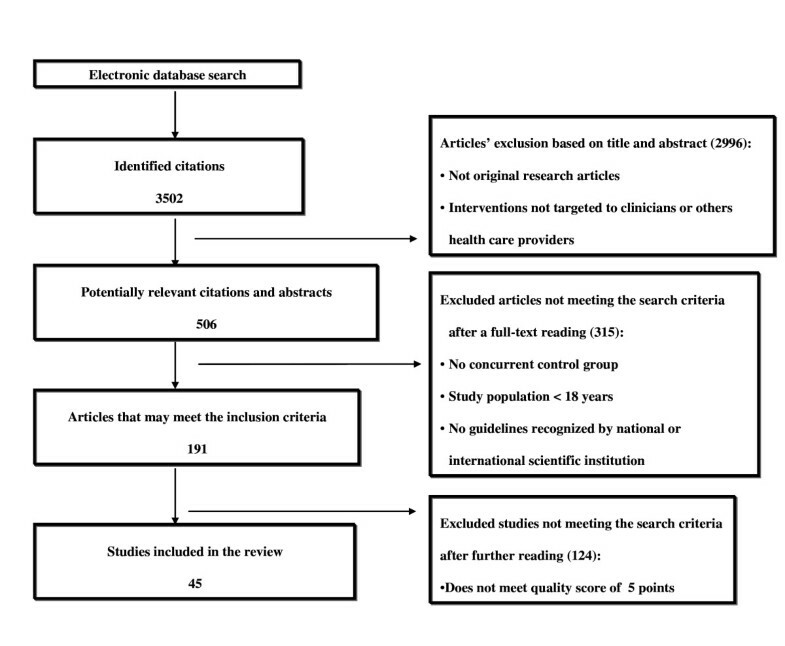 If one of the reviewers considered a reference potentially relevant, full-text articles were retrieved and examined independently, using the full set of inclusion and exclusion criteria to select the final number of studies for research. Disagreements between reviewers were resolved by discussion or by third author (G.D.). Two reviewers (C.S.C. and A.R.) assessed whether the use of computerized guidelines was going to improve the process of care and evaluated the positive or negative impact of computerized guidelines on the process of care. The description of each feature is reported in Table 1. User has access to recommendation in computer terminals, available at several workstations in the hospital. Recommendation is provided in different ways including reminders of overdue health care tasks, alerts of critical values, prompts for various active care issues. Software designer or producer is involved in the design of study. User automatically receives prompts (complete automation) instead of active initiation of the system by user (incomplete automation). Recommendations printed on paper forms and attached to patient charts by clinical support staff, so that clinicians do not need to look for the computer advice. Electronic recommendations linked to patient charts display automatically to clinicians when a clinician accesses the database. Data of patient are updated via network link to servers storing information about all contacts of patient with the hospital. The user is asked to justify the decision of disagreement with a reason such as "the patient refused" or "I disagree with the recommendation". Recommendations provided as chart reminders during an encounter, rather than as monthly reports listing all the patients in need of services. Computerised system provides recommendations in response to an order and the user simply clicks "OK" to order the recommended tests. Systems show better actions to perform, rather than simply providing a diagnosis. Systems recommend an alternative view, rather than simply recommending the order to be cancelled. Recommendation for a check justified by noting date of last exam and recommended frequency of testing. Recommendation design finalised after testing preliminary versions of software (beta version) with representatives from targeted user group. As well as providing chart reminders for clinicians, system generates postcards that are sent to patients to inform them of existing recommendation. Users are sent e-mails periodically that summarise users compliance with recommendations. Implementation of a recommendation is accompanied by a presentation or an appropriate explanation for following such suggestion. A training period is provided for users to experience the basic features of the software. Recommendations are focused on preventive or treatment issues or both options. Recommendations are oriented towards acute or chronic patients or both options. Recommendations suggest to administrate tests or/and drugs to patients or to perform other type of intervention on them or both options. completeness of follow-up for the appropriate unit of analysis (> 90%, 2; from 80% to 90%, 1; < 80% or not described, 0). The cut-off value for including an article in our paper was 5/10. The quality assessment of each study is reported in Table 2. Each study, comparing the impact of CCG versus NCCG, was considered as a unit of analysis. Positive Effect Prevalence, calculated as the proportion of studies showing a positive effect of CCG on the total of selected studies. Negative Effect Prevalence, calculated as the proportion of studies not showing any or negative effect of CCG on the total of selected studies. Chi-square test was performed in order to identify whether the differences between the proportions of the studies' positive and negative effects were statistically significant. The significance level was set at 5% (α = 0.05). Hosmer-Lemeshow test was applied to evaluate the goodness of fit of model. All analyses were carried out using SPSS package, version 13.0. A total number of 2,996 articles out of 3,502 was excluded because of the title and the content of abstract. Then, 191 out of 506 studies met the inclusion criteria. Forty-five articles were included in the final selection [14, 15, 22–64]. (Figure 1). Some of the articles included in Garg's and Kawamoto reviews [6, 12] were excluded by our selection [see Additional file 1]. The characteristics of selected studies are shown in Table 3. Selection process of studies on computerized guidelines. Automatic provision of recommendation in electronic version as part of clinician workflow (proportion = 0.82) and Degree of automation (proportion = 0.80) were the most frequent features used in the CCG software described in the selected articles. On the contrary, the least frequent features were Recommendation executed by noting agreement, Provision of a recommendation not just an assessment, Promotion of action rather than inaction (proportion = 0.11) as shown in Table 1. Proportions of studies with Positive and Negative Effect of CCG versus NCCG are shown in Figure 2. In the selected 45 articles the positive effect proportion of CCG was 0.64 (p = 0.053) [see Additional file 2]. 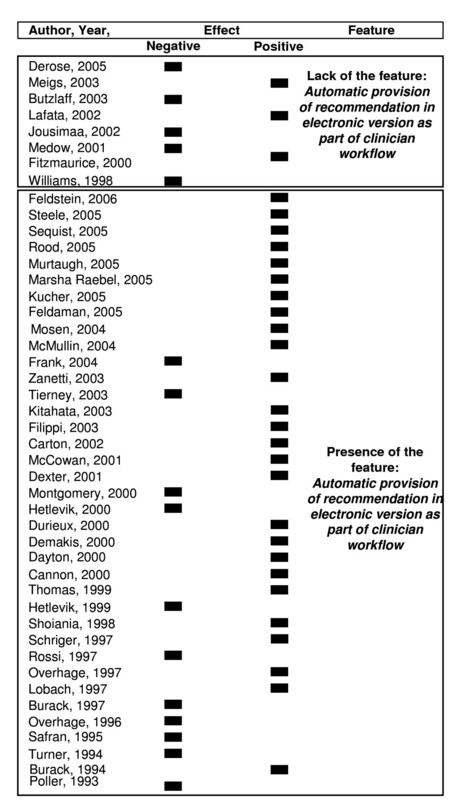 Plot of the effect stratified by " Automatic provision of recommendation in electronic version as part of clinician workflow" feature. The multivariable analysis highlighted two variables as statistically significant predictors of CCG positive impact on the process of care: Automatic provision of recommendation in electronic version as part of clinician workflow (Odds Ratio [OR]= 17.5; 95% confidence interval [CI]: 1.6-193.7) and Publication Year (OR = 6.7; 95%CI: 1.3-34.3). Besides, the feature Justification of recommendation via provision of reasoning (OR = 14.8; 95%CI: 0.9-224.2) resulted marginally significant in logistic analysis. The goodness of fit of the logistic model was confirmed in the Hosmer-Lemeshow test (p = 0.905). Previous researches [6, 10, 11] reviewed controlled clinical trials classified within different categories (e.g. drug dose determination, diagnosis, prevention) in order to assess the effects of CDSS on physician's performance and patient's outcomes. Enhancements on clinical performance were reported after the use of these tools. Furthermore, role of specific features of CDSS affecting clinical practice were identified by Kawamoto et al . Our study instead focused on the effectiveness of CCG (a group of CDSS strictly related to the medical decision making). The functionality and the effectiveness of CCG until 1998 had been studied by Shiffman et al. . They reviewed the literature showing that CCG delivered positive effect, but no quantitative and synthetic analysis were carried out. Our contribution provides an updated, systematic and quantitative analysis aiming to understand the design factors which are responsible for the success or the failure of computer-based guidelines compared with NCCG. The resulting evidence showed that the use of CCG seems to have a significant impact on the process of care. In addition to qualitative evidence reported by Shiffman , the multivariable analysis highlighted the positive effect of the presence of an operating CCG system, characterized by the automatic provision of recommendation in electronic form as part of clinician workflow. This system is designed for providing automatic support to clinicians so that they don't need to look for computer advices. The system automatically provides support on clinical or administrative task and recommends execution or avoiding of it during the clinical process, (e.g. automatic recommendation of executing prophylaxis in patients at risk of deep-vein thrombosis ), and in decisions, such as the selection from a set of potential alternatives based on predefined criteria (e.g. automatic prompt of further assessment for potential Latent Tuberculosis Infection in patients selected according to specific criteria ) . The positive effect might be related to time saving for clinicians, facilitation of the information retrieval and integration among different users. The evidence of increased probability of positive effect for CCG, showed after 1999, might suggest that the improvement of the process of care may be related to the development of more automated CCG systems [66, 67]. The physicians' involvement in decisions regarding clinical recommendations, even though marginally significant in the multivariable analysis, might be a key element for the effective organization of the whole process of care, relating to the improvement of the adherence of physicians to guidelines. This aspect is coherent to the active roles that physicians should play in Clinical Governance context [68, 69]. Some limits of our study might be related to the lack of quantitative estimate of specific outcomes linked to clinical conditions. However, the evaluation of synthetic quantitative measures of CCG effect was unfeasible because of the high heterogeneity of analysed guidelines, population and outcomes. However, our work presents the synthetic result on the effectiveness of CCG, providing a quantitative and reproducible evaluation. Findings of this paper suggest clinicians, managers and other health care decision makers which features of CCG might improve the structure of an electronic system in health care settings. At the same time, the implementation of CCG may be integrated with more training and investment in user friendly hardware and software. Therefore, specific studies should be carried out to evaluate the cost-effectiveness of implementing CCG systems. Funding for this project "Development, application and effectiveness valuation of an informative system to support the clinical research" was provided by the Italian Ministry of Health. GD, LP and WR contributed to the conception of this paper; GD, LP RG, LoS designed the study. SCC and RA selected articles that met the inclusion criteria and extracted data. LS, LP conducted the statistical analysis. All authors made substantial contributions to the interpretation of results and have seen and approved the final version.